The disastrous effect that we have had on our planet in the last century is too depressing to think about. There are so many issues: from the threat to animals, to cutting down forests, to that hole in the ozone layer, to chronic illnesses caused from processed foods, to landfills... It's going to take a long, long time before we can fix any damage done. It seems like so many people don't realize, or are slowly-gaining consciousness, that how we live – what we eat, where our food comes from and/or how a product is made, and what packaging its in – really does make a difference to the global ecological footprint. How much do you consume? I'm pretty conscious about trying to cut down waste. 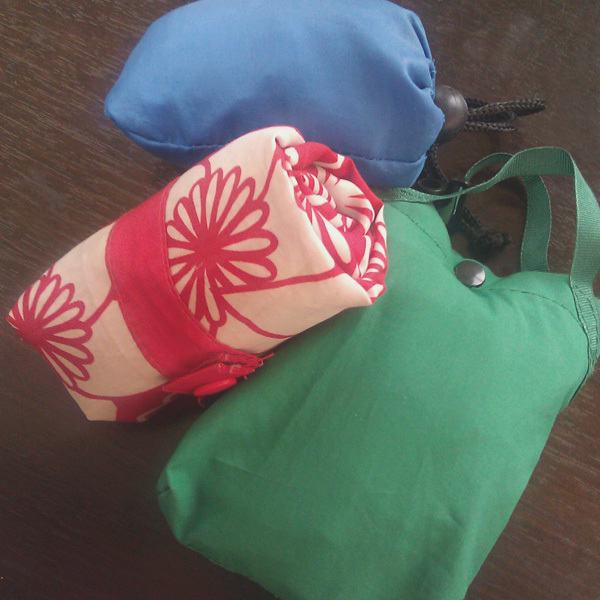 For the longest time, I always bring reusable shopping bags everywhere, especially when food shopping. It was a great feeling when the day came that there were no plastic bags in the house! Nowadays, most supermarkets have a selection of branded reusable bags to purchase for a nominal price, and give a "go green" refund off your transaction for each bag you bring for your food shopping. Shops like IKEA are great, because there are no plastic bags! In Hong Kong, a plastic bag levy was introduced a few years ago. Major supermarkets and chain stores charge HK 50¢ (US 6¢) for each disposable plastic bag. (The levy is paid to the government to protect the environment). It's a success in that disposable plastic bag usage has dropped, and many people are carrying their own bags. Just make sure to wash them once in awhile. Those single-use bottles of water you buy, especially those kid-sized ones, also cause a massive amount of waste. We do our best to use reusable BPA-free water bottles all the time. 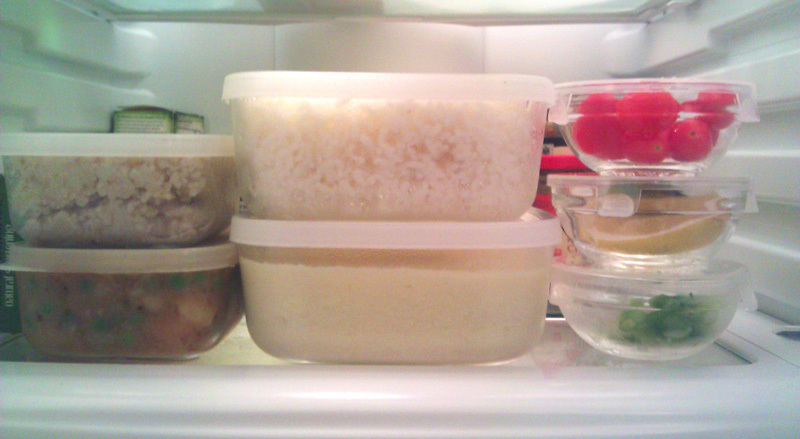 But with leftovers, I found myself using a lot of cling film/ plastic wrap to keep everything fresh. 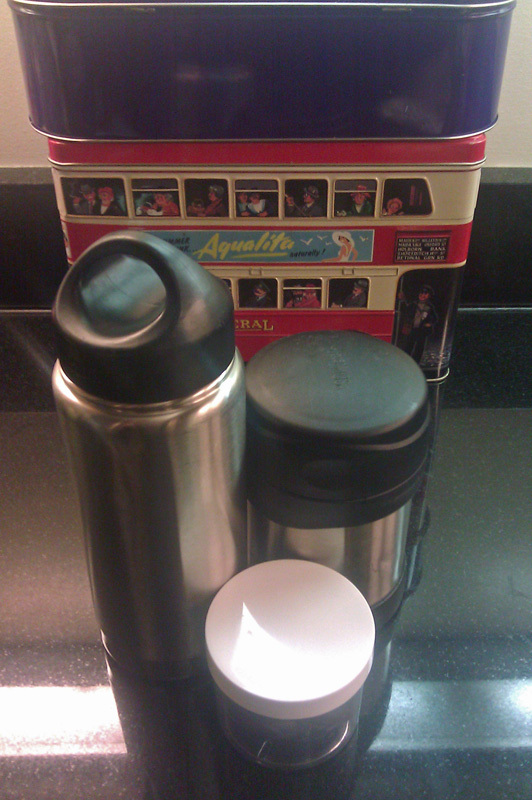 Although we re-use those plastic take-out containers, they tend to disappear, so I thought it would be a good time to invest in some glass food containers to keep those little bits. I'm not a fan of plastic food containers, and these are great so you can reheat food without having transfer to bowl or plate. Very handy! Porridge, stew, rice (for a fried rice! ), cauliflower soup, fruit and veggies.